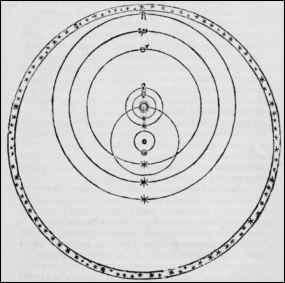 The Copernican revolution, a turning point in human thought, saw Aristotelian physics and the hierarchical universe swept away. Yet working astronomers continued to save the phenomena with geometrical models. Their revolution would occur only after the ancient assumption of uniform circular motion was destroyed. Observations by Tycho Brahe interpreted by Johannes Kepler would accomplish the deed. Tyge Brahe, now customarily referred to by his first name in its Latin version, Tycho, was born in 1546. Before he was two years old, he was abducted by his uncle Jörgen Brahe. Tycho later wrote that his uncle "without the knowledge of my parents took me away with him while I was in my earliest youth" (Thoren, Lord of Uraniborg, 4). Tycho's father had more sons and eventually gave his permission for Tycho to be raised by the childless Jörgen. The expectation that Tycho would inherit Jörgen's wealth likely helped decide the matter. The Brahe family was prominent in the governing of Denmark, and Tycho's brothers prepared themselves for government careers. For them, learning Latin, the scholarly language of Europe, would have been a waste of time. Tycho, however, encouraged by Jörgen's brother-in-law, Peder Oxe, began studies at the University of Copenhagen in 1559. Impressed by successful predictions of an eclipse, Tycho became interested in astronomy. In 1562 Tycho traveled with a tutor to the University of Leipzig. The tutor was supposed to keep Tycho focused on studying law. Tycho, however, made observations while his tutor slept. He found that astronomical tables were inaccurate and resolved to improve them. To do so, he would need better instruments. Shortly after Tycho's return to Denmark, in 1566, Jörgen and the king fell off a bridge near the royal castle at Copenhagen. Probably both had been drinking. Perhaps the king fell in first, and Jörgen jumped in to rescue him. Jörgen did not recover from his carousing and icy dunking but instead died of pneumonia. He had not yet completed making Tycho his legal heir, so his wife inherited instead. Tycho went abroad again. In Rostock he lost the bridge of his nose in a duel. The two student protagonists of the duel had competed in studying mathematics, and the duel may have been over which of them was the more skilled mathematician. Thereafter, Tycho carried a little box of adhesive salve to hold on a nosepiece, supposedly an alloy of gold and silver. When Tycho's tomb was opened in 1901, the nasal opening of his skull was found to be rimmed with green, an indication of exposure to copper. Perhaps Tycho had a lighter-weight copper nosepiece for everyday wear? Tycho returned to Denmark in 1567 but soon left on another trip abroad. Oxe, now lord high steward of Denmark, arranged for Tycho to be named to the next vacant cannonry at Roskilde Cathedral. Tycho anticipated living on the high income of a nobleman and at the same time pursuing a career as an astronomer and scholar—a career barred by custom to noblemen and not usually subsidized by the crown. In Augsburg for much of 1569, Tycho inspired a wealthy humanist to pay for construction of a huge wooden quadrant on his country estate. It had a 19-foot radius, and its arc was marked off in sixtieths of a degree. Before Tycho could make many observations, however, he was called back to Denmark. His father was dying. After the Brahe estate was settled, in 1574, Tycho was independently wealthy and could do whatever he wanted. Two of his brothers contracted marriages; Tycho began planning another trip. He already had a mate, but she was not a noblewoman, and they could not be formally married. An aristocratic marriage would have involved Tycho in courtly activities and taken time away from scholarly studies. 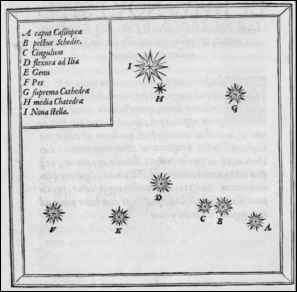 On the night of November 11, 1572, returning from his alchemical laboratory to eat supper, Tycho noticed an unfamiliar starlike object in the constellation Cassiopeia. If nearby, it would appear to shift its position with respect to the background stars. But its parallax, or angle of view, did not change from night to night. Evidently Aristotle had erred when he decreed there could be no change in the heavenly spheres beyond the Moon. Those who dismissed this implication of Tycho's discovery were in turn dismissed by him as thick wits and blind watchers of the sky. 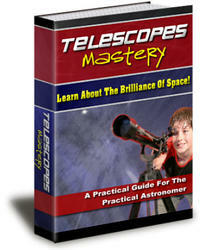 Publication of the discovery made Tycho famous, and he resolved to make astronomy his life's profession. Figure 16.1: The Great Quadrant at Augsburg. Tycho recognized the need for systematic observations night after night with instruments of the highest accuracy obtainable. His wooden quadrant constructed in Augsburg in 1569 had a 19-foot radius and arc marked in sixtieths of a degree. It was very accurate, but also cumbersome, requiring many servants to align it, and permitting only a single observation nightly. 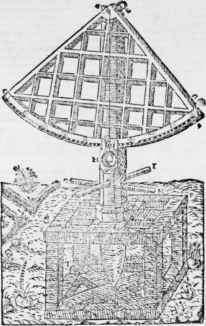 Source: From Tycho Brahe, Astronomiœ instauratœ mechanica [Instruments for the restoration of astronomy]. Noribergae [Nürnberg]: apud L. Hvlsivm [by Levinus Hulsius], 1602. 107 unnumbered pages, woodcut and engraved illustrations, map, plans. Figure 16.2: Tycho Brahe's Nova Stella or New Star of 1572. From Tycho Brahe, De nova et nullius avi memoria prius visa Stella, iam pridem Anno a nato CHRISTO 1572, mense Novembri primum Constecta, contemplatio mathematica. Tycho's new star was a supernova, a star that explodes and increases hundreds of millions of times in brightness. He marked it number I in the constellation Cassiopeia. Edgar Allan Poe had Tycho's new star in mind when he wrote his poem Al Aaraaf about a new star whose glory swelled upon the sky and whose glowing Beauty's bust beneath man's eye. Courtesy Copenhagen University Library. Figure 16.3: Tycho Brahe's Great Mural Quadrant at Uraniborg. The quadrant, completed in 1582, was forged of brass, 2 meters in radius, 13 millimeters broad, 5 millimeters thick, and marked in sixths of a minute. Tycho points to the heavens. One assistant looks through the back sights; another reads off the time; a third records the data. The dog at Tycho's feet is a symbol of sagacity and fidelity. 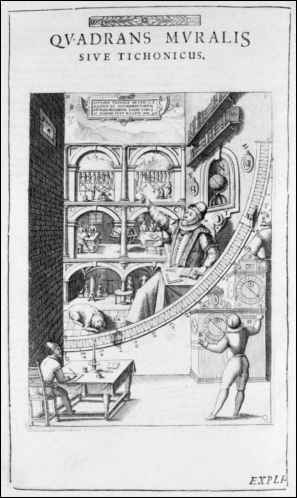 In the background is a representation of the main building with an alchemical laboratory in the basement, the library with its great globe and space for making calculations on the main floor, and above instruments for observing. In a niche in the wall behind Tycho is a small globe, automated to show the daily motion of the Sun and the Moon, and also phases of the Moon. On either side of the small globe are portraits of King Frederick II and Queen Sophia. Their financial generosity made the whole thing possible. At the top of the engraving is a landscape and setting sun. Source: From Tycho Brahe, Astronomic instaurata mechanica [Instruments for the restoration of astronomy]. Noribergae [Nürnberg]: apud L. Hvlsivm [by Levinus Hulsius], 1602. 107 unnumbered pages, woodcut and engraved illustrations, map, plans. Stjerneborg, with more stability than his castle floors provided, large instruments for observing stellar and planetary positions, a paper mill and printing press, and other necessities for self-sufficiency. The new star of 1572 was the first great astronomical event of Tycho's lifetime; the comet of 1577 was the second. Tycho showed that it was above the Moon, moving through regions of the solar system previously believed filled with crystalline spheres carrying around the planets. Aristotle's distinction between the corrupt and changing sublunary world and the perfect immutable heavens was shattered. Figure 16.4: The Tychonic World System. In Tycho's system, the Sun and the Moon circle the Earth (the black dot at the center). The outer sphere of the stars rotates about the Earth at its center every 24 hours. 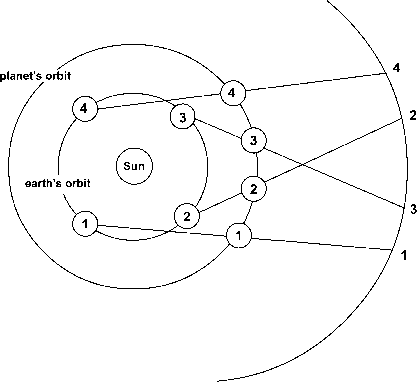 Mercury, Venus, Mars, Jupiter, and Saturn are in circular orbits centered on the Sun. Source: Engraving from Tycho Brahe, De mundi aetherei recentioribusphaenomenis, 1588. Courtesy Copenhagen University Library.